The "Midnight Rider" returns in this 200-gram reissue! Praise for the 200g 45 RPM single of "Midnight Rider" / "These Days"
"Gregg Allman's voice came sailing clear throughout the room, the band punched through the air with force and clarity. Impressively, the dial was only set at 11 o'clock-and by the time I pushed the envelope up to around two (just for the heck of it), there wasn't a drop of distortion created-just more clean air in the volume. As far as my ears were concerned, Chad's special single release of these two Gregg Allman performances turned out to be a sonic victory." — Wayne Goins, Positive-Feedback.com, Issue 98, Aug. 22, 2018. Read the whole review of the full album and 45 RPM single "Midnight Rider" / "These Days" here. Gregg Allman's 1973 solo debut also became his biggest hit, a No. 13 LP featuring his Top 20 classic "Midnight Rider." Analogue Productions now brings forth a sparkling reissue of this classic disc, mastered from the original analog tapes by Ryan Smith at Sterling Sound. And presented as a 200-gram sonic superstar plated and pressed at our own Quality Record Pressings! By the end of 1973, the Allman Brothers Band seemed to have it all nailed down, writes reviewer Rickey Wright. They'd proven their mettle with a fine synthesis of blues, jazz, folk, and country influences; expanded upon it with the definitive Fillmore East set; and moved forward after the separate losses of guitarist Duane Allman and bassist Berry Oakley. The group's myriad strengths, in fact, might've been the reason that one of their most obvious gifts — Gregg Allman's pained, growling voice — was sometimes overlooked. 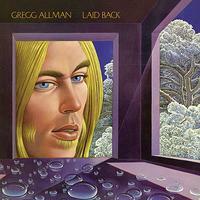 Laid Back, Gregg Allman's first solo disc, seems in part an effort to gain a little more recognition. It worked, particularly given the strong radio response to its opening track, a loping remake of "Midnight Rider." Likewise, much of the album's remainder finds Allman tweaking the band's blues ("Queen of Hearts") and country sides (a cover of Jackson Browne's "These Days"); horns and gospelish backing vocals add to the personal, often mournful feel. Laid Back is an often convincing version of the man's music. Wonderfully done. I keep spinning this one because it sounds like Greg is alive and playing in front of me with his band in my music room. This has a reputation for being a well recorded album. I've a NM WLP copy which I've been very happy with, so hesitated purchasing the AP reissue. All I can say is "WOW!" This is now my go-to copy and will serve as one of my demo albums. This album sounds much better than the original. It is pressed on dead quiet vinyl resulting in superb sound reproduction. Simply, this pressing is a joy to listen to and a must have for any Gregg Allman fan. Thanks again to the team at Quality Pressing for another superb piece of vinyl and to Gregg Allman for making the right choices when it came to having this album re- released.